Come on everybody let's rock! : That famous sideways grin, the twinkle in his eyes, the hair…and those moves! He’s a man who needs no introduction. He’s the King of Rock and Roll. Elvis Presley was the singing sensation that swept the nation, prompting headlines like “Presley Puts the Swoon Back in Croon.” His voice, charisma, and stage presence are beyond legendary. After all these years his music still makes you jump to your feet and dance. You'll get it all on 3 CDs for only $34.96-PLUS FREE SHIPPING when you pre-order today. 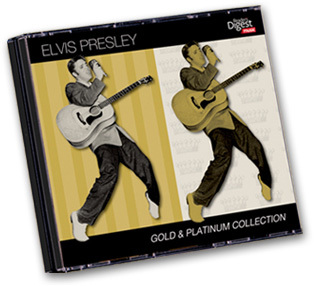 So get “all shook up” to the sparkling sounds of Elvis’s gold and platinum hits. They called him “the young man with the big beats,” and now, Reader’s Digest is proud to give him the “royal treatment” on the 35th anniversary of his passing. Pre-release price is $34.96 (RRP $49.96) with free postage – less than 60c a song! Why this photo ? Great idea that we should all be proud of. Readers Digest has been very supportive all along since the Sixties ! Wish all other magazines would follow their (R.D.) exemple !? For presidents of elvis fan clubs to follow up ! !